It's 19:27 in Berlin, Germany right now. 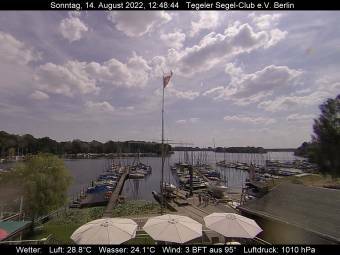 Tegeler See The webcam overlooks the port of the Tegeler Segel-Club, Berlin, and the Tegeler See - refreshes every 2 minutes, current weather data are also available. Berlin: View of the Wannsee, 0 miles away. Berlin: Olympiastadion Berlin, 0 miles away. Berlin: City Center, 0 miles away. Berlin: View from the Lützowplatz, 0 miles away. Berlin: Stadium 1. FC Union Berlin, 0 miles away. Berlin: Spreebogen, 0 miles away. Berlin: View over Berlin, 0 miles away. Berlin: Oberbaumbrücke, 0 miles away.